The West Seattle Junction Association is seeking to hire an artist for a neighborhood beautification project. 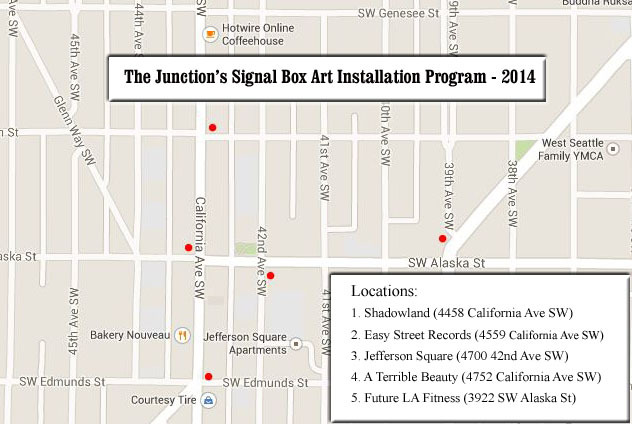 The West Seattle Junction has up to five signal boxes which are an excellent opportunity to create new art for our community. Our organization will provide funding, project oversight, and permitting. There will be a volunteer committee to choose the artist. The artist concept will need to follow City of Seattle guidelines and be approved by the City’s Arts Representative. Per the City of Seattle, the following guidelines define the considerations the Arts representatives will use to review the designs. • Artwork should have a consistency of style and medium to create a unified aesthetic between signal boxes. Think of them as a series, rather than individual pieces of art. • Applicants are encouraged to create designs for the boxes that contribute to the visual quality of the streetscape. For example, consider using a limited palette of colors and simple graphic images to avoid visual clutter. If original artwork is being created, a lead artist/designer should be responsible for designing the images. • The primary purpose of this program is to create a public benefit. Therefore, images that convey messages appearing to advertise, or promote a private entity (corporation, neighborhood business, chamber of commerce, or other community organization) will not be accepted. • Images that create a driver distraction or could be confused with traffic signs will not be accepted. • Arts representatives will review locations to determine proximity to artwork in the public art collection. • Applicants must demonstrate that they have community support for the designs. • What is your concept for the signal box project? The City of Seattle asks for them to be part of a series. • What style and medium to your suggest for the project and why? • Submit a full color sample concept of what you envision for the project. Hard had copy please. • Please feel free to submit more that one concept. • If selected, please be ready to go through the process with the City of Seattle which includes submitting a color rendering at a 1/8” scale on 11×17” paper for each box. • Compensation is $1000 per completed box. Ideally there are 5 in total.